Eggs, depending on what you want to do with them, can be easy or complex. From poaching, frying and omelettes to Eggs Benedict and the Scotch Egg, there’s a plethora of ways to enjoy eggs. In India, the most commonly made egg item is “Egg Bhurji”. In Japan, it’s Omurice. Eggs are also a brilliant source of protein, with the yolks containing a lot of Vitamin D.
Finely chop the onion and slice the green pepper. Once the butter is fully melted, add the onions to the skillet. Stir the onions as they cook, until they are almost translucent. Add the green chili and cook for about 30 seconds. Turn the heat down to medium and crack the eggs into a separate bowl. Whip the eggs with the milk for 30 seconds and add the chilli powder, garam masala, turmeric powder, and salt to the eggs. Add the eggs to the pan, and cook, constantly stirring and scraping the bottom until the eggs are fully cooked. Break up the eggs into smaller chunks. Serve warm with naan, roti, or bread rolls. Heat a skillet or large frying pan over medium-high heat and add the butter to the pan. Add all the spices to the whipped eggs and whip for no longer than 20 seconds. Pour the eggs onto the pan once the butter begins to sizzle. 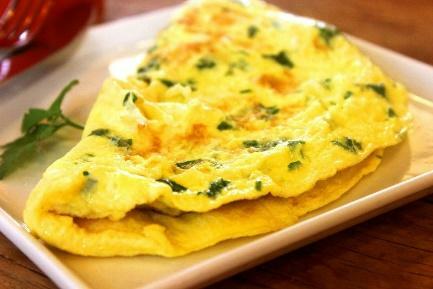 Flip the half moon shaped omelette and serve with any optional sauces. Harshul is a Mississauga resident who’s passions include cooking, learning about food. spending time with his family, as well as playing the guitar and trumpet. He first began baking at the age of 8, and hasn’t stopped since!